Adrienne Gear, Stenhouse Publishers, 2008 – Stenhouse Publishers writes: "How can you help students find meaning in informational texts and become independent strategic readers and thinkers? 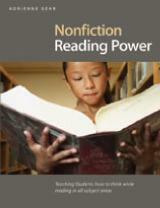 Nonfiction Reading Power gives teachers a wealth of effective strategies for helping students think while they read material in all subject areas." Stenhouse lets you preview Chapter 2 before deciding whether to buy. Stephanie Harvey and Anne Goudvis, Heinemman, 2008 – "Heinemman writes: Stephanie Harvey and Anne Goudvis have adapted the strategy instruction made famous in Strategies That Work and The Comprehension Toolkit to meet the developmental needs of our youngest readers. The Primary Comprehension Toolkit launches students in Kindergarten through Grade 2 into the exciting world of nonfiction reading, writing, and thinking." Harvey Daniels, Heinemann, 2009 – This veteran classroom teacher has so much to say, as you will see when you visit his many pages at Heinemann. 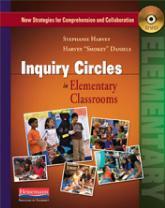 Heinemann says about this DVD: "This live-from-the-classroom DVD invites you to eavesdrop as student-led teams pose questions, undertake research, read strategically, build knowledge, understand, and act. You will see teachers teaching students the specific comprehension and collaboration strategies they need to operate effectively in structured, responsible teams."